Justine Mastin (AKA Justini Yogini) is proud to be the creator and fearless leader of YogaQuest. Justine completed Corepower Yoga’s Teacher Training Levels 1 and 2 in 2010. That same year, she completed Street Yoga Teacher Training, a style of yoga for working with underserved populations. 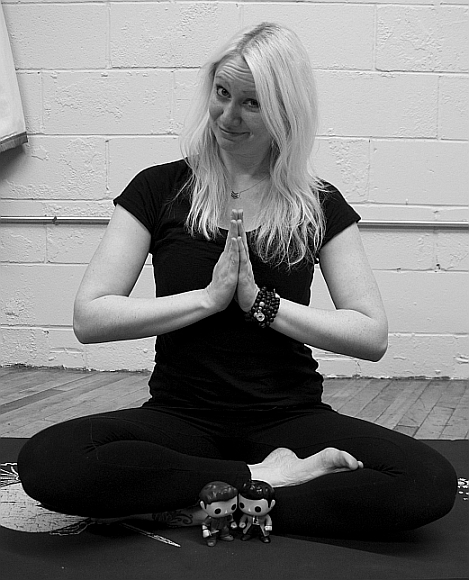 After never feeling quite comfortable in the corporate yoga world, Justine created YogaQuest in 2011 as a way to encourage geeks to get moving and to show people that yoga doesn’t have to be quiet and contemplative—it can be just as weird as the people who are practicing. Justine also has a master’s degree in addiction counseling and a post-master’s certificate in marriage and family therapy. Justine sees clients in private practice in the yoga studio at Blue Box Counseling. She is passionate about incorporating yoga, mindfulness, and concepts drawn from geek culture into therapeutic practice with clients.